The question is nearly impossible to answer unless you have experienced my full range of skills for an entire 4 or 5 hour event live. In my opinion, the entire event from beginning to end requires a flawless mixture of professional announcements, perfect blend of music, and perfect timeline all molded together in the right way with the best equipment and lighting to create an artistic masterpiece. To simply refer to me as a DJ is an understatement because I am so much more to the success of the event. My impact is huge as I am the voice, control the flow, and am the glue that holds everything together in a very public way! When you invest a little more hire DJ Forrest, you get a lot more for your investment because you have the peace of mind that your event will be as good as it could possibly be! 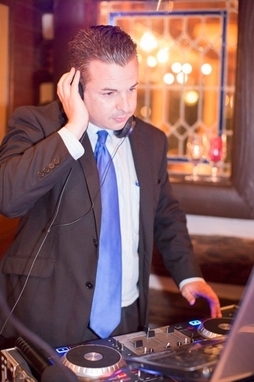 My skillset will maximize your event from dinner to dancing in a classy way. When asked what type of DJ I am, I respond with the perfect mix. You will find me at a Sweet 16 playing the latest hits fresh off the billboard charts one day, and the next you will find me serving as the music maestro and MC for a 60th birthday celebration. Below is a combination of videos that showcase DJ Forrest and may answer some questions you have that cannot be expressed in words 🙂 Contact him today to see if he is available on your date. Here is a video from last weekend. Notice the priceless fun the kids are having! Junior High Dance with DJ Forrest: 10-20-13 from Xceptional DJ’s + Photo Booths on Vimeo. Another bride that is thrilled to have DJ Forrest on the job! Beautiful Couple happy having Forrest to run the show!